The client listed the sea and pool view as top priority for purchasing the apartment and this aspect naturally served as the main inspiration for this project. After studying the existing structure, we proposed to remove several non-load bearing walls and partitions. This took out one of the bedrooms but extended the living area and master bedroom space. Most importantly, the owner and her guests will now have both a sea and pool view from her living room. The removal of 3 main non-loading walls also allowed greater natural ventilation throughout the home in an egg shaped circulation. 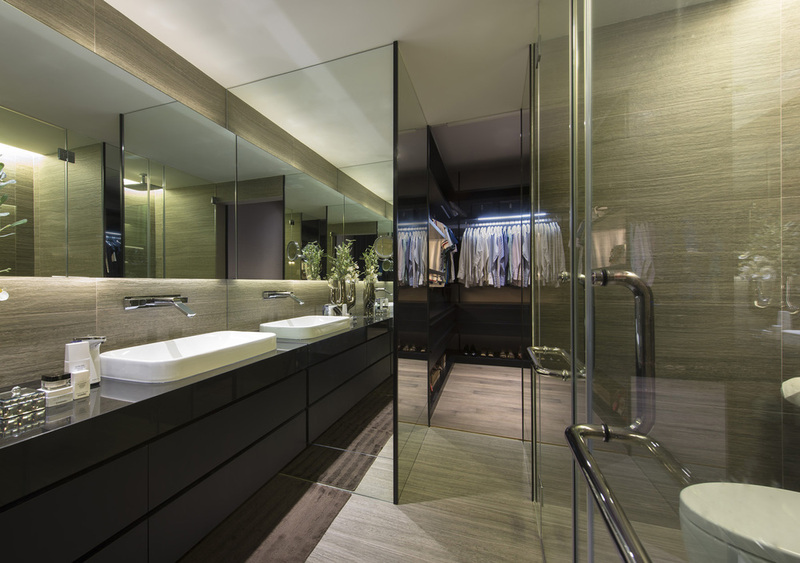 This also allowed the client to access her bedroom either through the living room, past a frameless sliding glass panel or via a corridor where the open concept bathroom and wardrobe is located. To reduce the need for artificial light during the daytime, we created a clerestory window above the sofa to allow the bathroom space to be naturally lighted.